"Oh my god, is he proposing??" my friend's text message read. I recoiled in horror. "No, no, no and NO!" I wrote back straight away. "We're just having dinner." Considering where we were having dinner, it wasn't too difficult to see why she thought my boyfriend was going to pop the question. 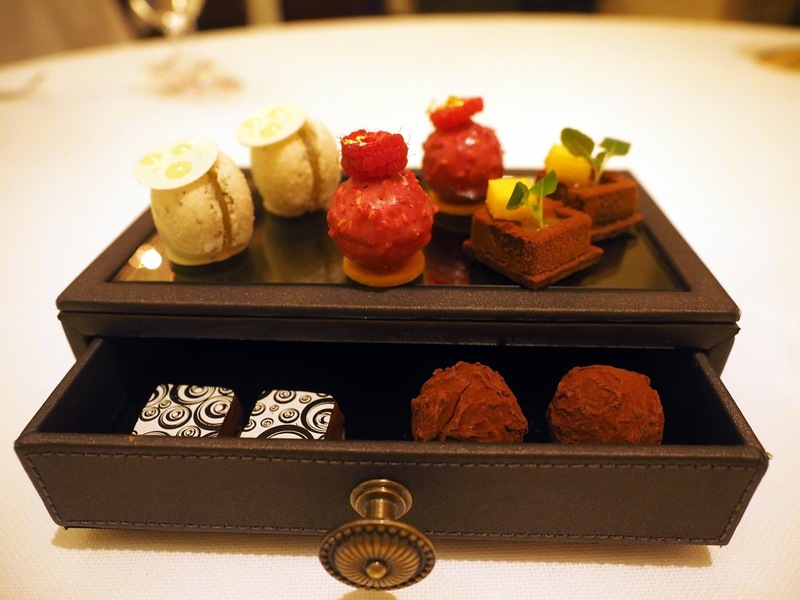 Caprice restaurant in the Four Seasons Hotel in Hong Kong has been consistently achieving accolades for its French fine dining experience - in 2013, it was ranked 73rd place in the top 100 restaurants in The World’s Best Restaurants Awards. 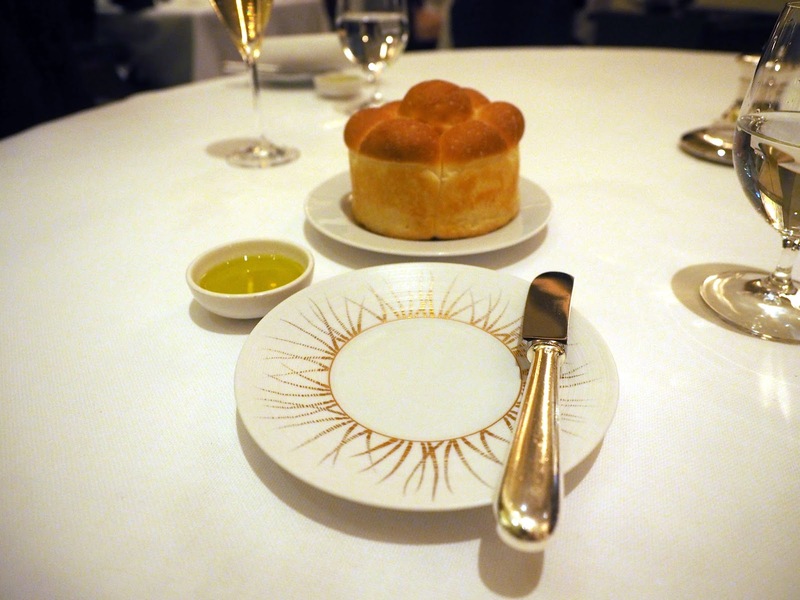 From 2010, it was awarded three michelin stars...until it was demoted to two michelin stars in 2014. And that's what had my curiousity piqued: all my previous experiences with Caprice (corporate lunches and family dinners) were pre-2014 - and I wanted to know if much had changed since then. Entering Caprice in the Four Seasons Hotel in Hong Kong. Initially, it appeared that not much had. 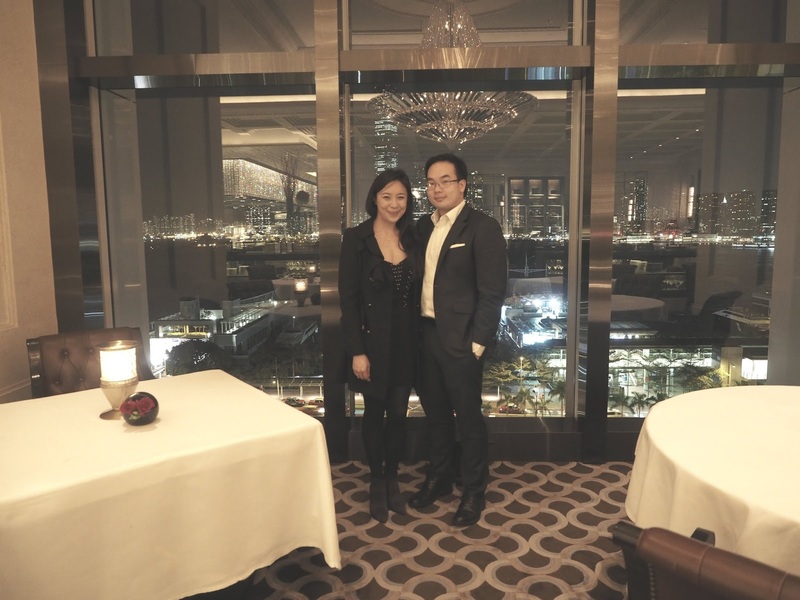 A warm and welcoming maître d took us to our table, which sat back slightly from the view of Hong Kong's harbour and the Kowloon skyline. Giant diamond shaped chandeliers with oriental tassels hung above us, filling the area with a warm, slightly orange glow that I have come to associate with French restaurants (see my review of La Tour D'Argent restaurant in Paris), and jazz saxophone music played unobtrusively in the background. I (unintentionally) tested the sommelier's knowledge when I asked him about the difference between two types of champagne (both HK$250 / US$32), and he instantly informed me that one was pinot noir based and the other was chardonnay based. Opting for the Egly Oriet (the pinot noir one), I was very pleased to find the champagne had a peach blush and a refined, fruity flavour that wasn't overly tart. I later also opted for a glass of Gevrey Chambertin Dom 2010 pinot noir (HK$240 / US$30) - a pleasant and easy to drink pinot, with a light cherry flavour. "I only drink champagne on two occasions: when I am in love, and when I'm not." - Coco Chanel. To begin with, we were served a hors-d'oeuvre of Spanish ham with egg yolk emulsion. 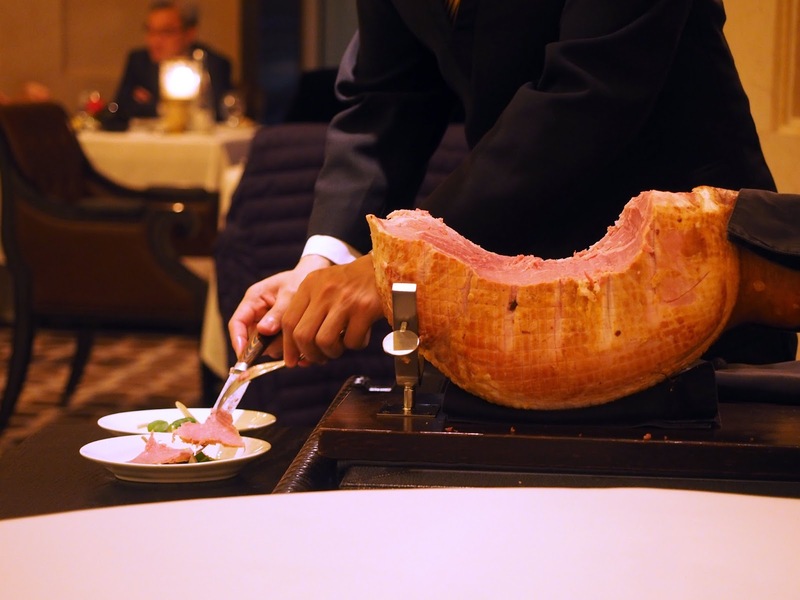 I'm not a fan of ham, but this was pleasing: a rich, smokey flavour with a tender, almost soft, texture. The giant bread pastry from Morocco that followed was less impressive - it tasted like the light, puff cake that you find in Chinese bakeries. Tender and smokey Spanish ham. Sadly the Moroccan bread did not live up to expectations. Think puff pastry. This was, however, redeemed with a choice of four pastries. 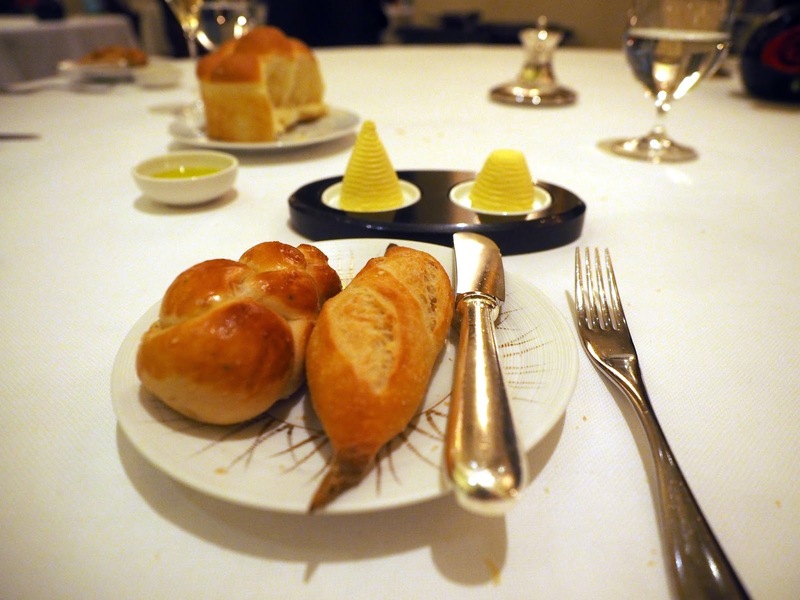 I HIGHLY recommend the seaweed butter bread roll for those of you who love your baked goods soft, rich and buttery. Despite my doubts, there was only a hint of seaweed (and only if you took the time to smell it), but remember that going for this bread comes at a price: your fingers will be oily afterwards from all the butter. The seaweed butter roll on the left is to die for. Literally, when you think about the amount of butter they used. 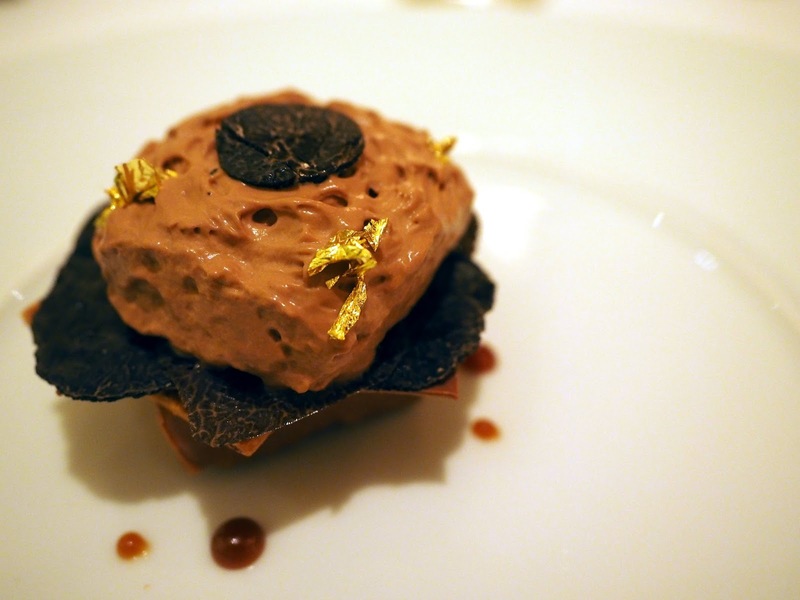 We opted for their seasonal menu which was black truffle themed, and costs HK$1,695 (US$220) for seven courses. 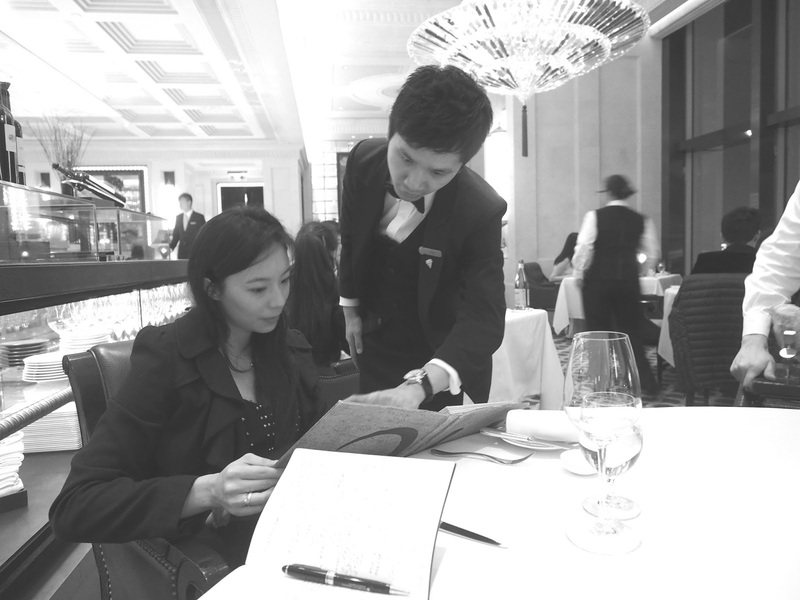 Note that their normal set menu costs around HK$1,990 (US$255) for 10 courses. First up was the Flammenkuche tarte, which was beautifully light and crispy. Despite the large slices of black truffle, the flavour was subtle, perhaps partly overwhelmed by the onion and four year old cheese (neither of which I had a problem with!). What was somewhat disappointing was the artichoke - this almost seemed like an afterthought added on top that really didn't add much to the dish. 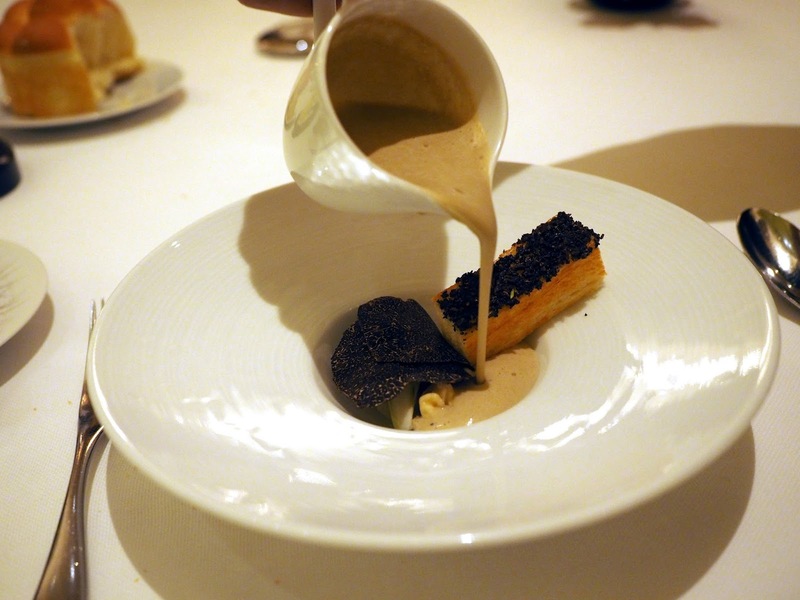 Next we had the pork ravioli with large black truffle, toasted black truffle brioche and again artichoke creamy soup. I found the ravioli strangely sour, and the soup surprisingly too creamy (surprisingly, because I love creamy soups). Overall the dish didn't commit to any particular flavour, creating the impression that it lacked punch. Pork ravioli and artichoke soup. 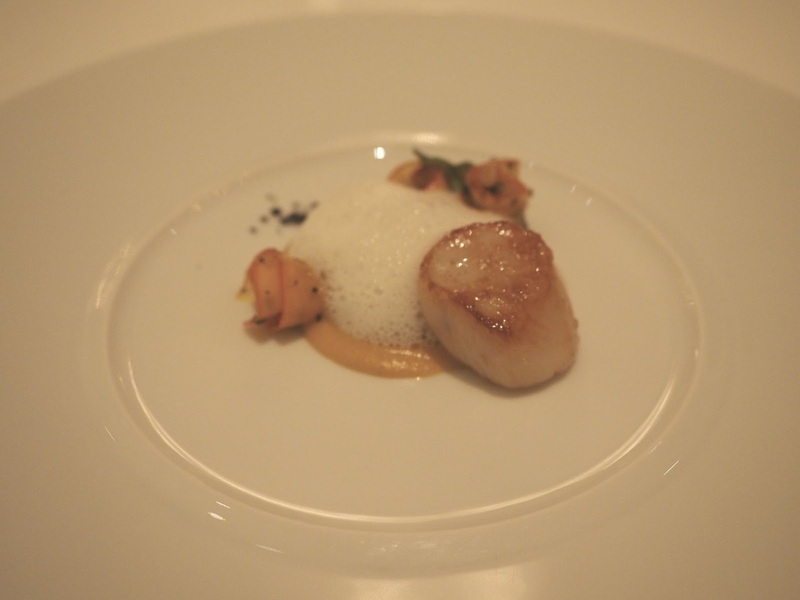 Then came the pan seared scallops with raw pumpkin and pumpkin puree (and of course, black truffle). The scallop was seared perfectly, and I really enjoyed the fresh pumpkin puree, but the raw pumpkin rolls were hard and tasteless. Seared scallop with pumpkin puree. After this was my personal highlight of the night - roasted Brittany Blue Lobster with asparagus polenta and black truffle. Given that I'm not a lobster fan, I was hugely impressed with its flavour, and how it was complemented and balanced by both the truffle and the polenta with its sweet sauce. The dish also came with a deep fried lobster claw - I don't eat deep fried food, but my boyfriend assured me it was good. 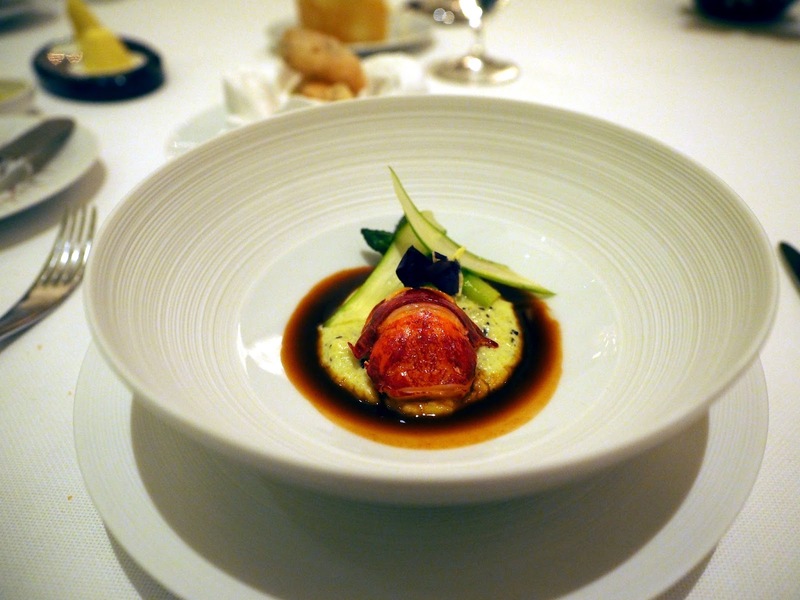 Lobster with asparagus polenta and black truffle. The next main was the braised and caramelised pork belly with green bean and finely sliced celery salad. I have to admit that this was somewhat disappointing: the pork belly was too thick to be able to enjoy all layers of it in one mouthful, and to add salt to injury...it was overly salty. Surprisingly, the greens and sliced celery were a hit though - even for my boyfriend, who normally shuns vegetables. 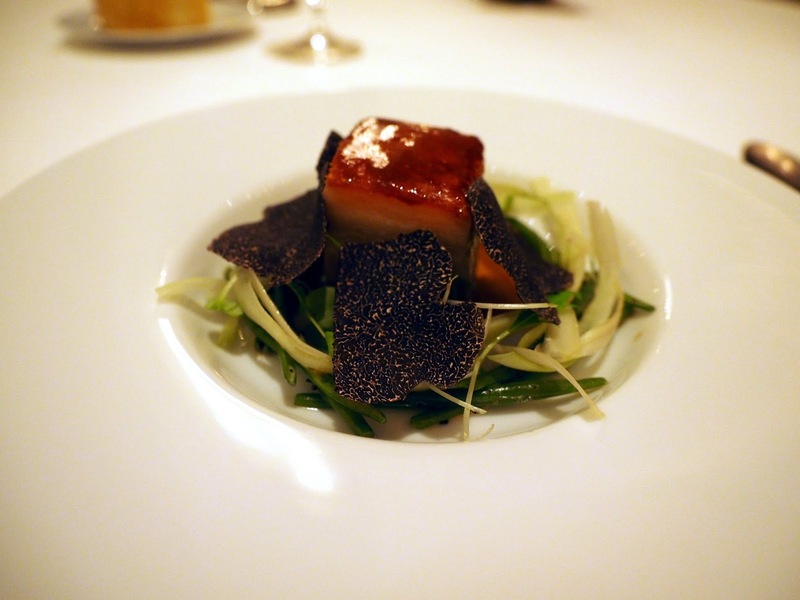 Caramelised pork belly with truffle and sliced beans and celery. Almost at the end, we were served crispy apple that was cut into beautifully thin slices, along with a creamy, brie like cheese. Perhaps it was the combination with the apple, but I found the cheese was a bit tart and acidic. 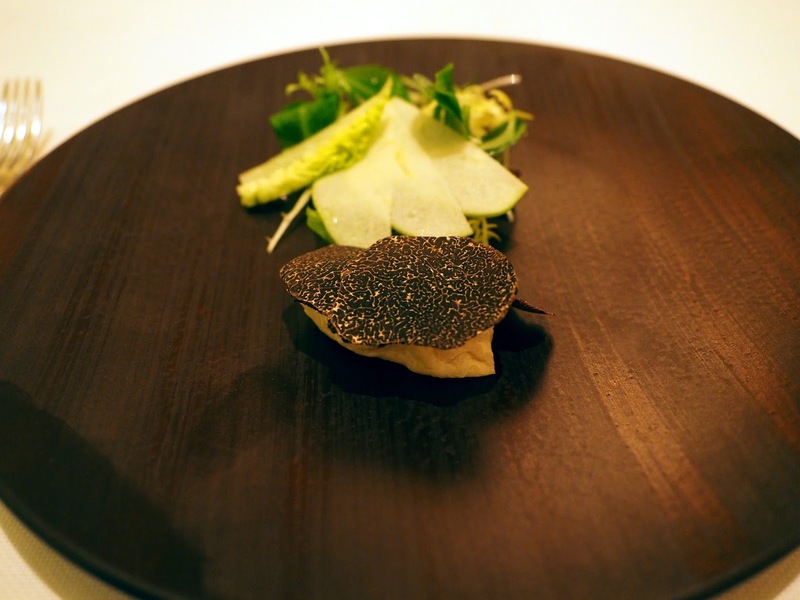 Crispy apple slices with creamy cheese and black truffle. 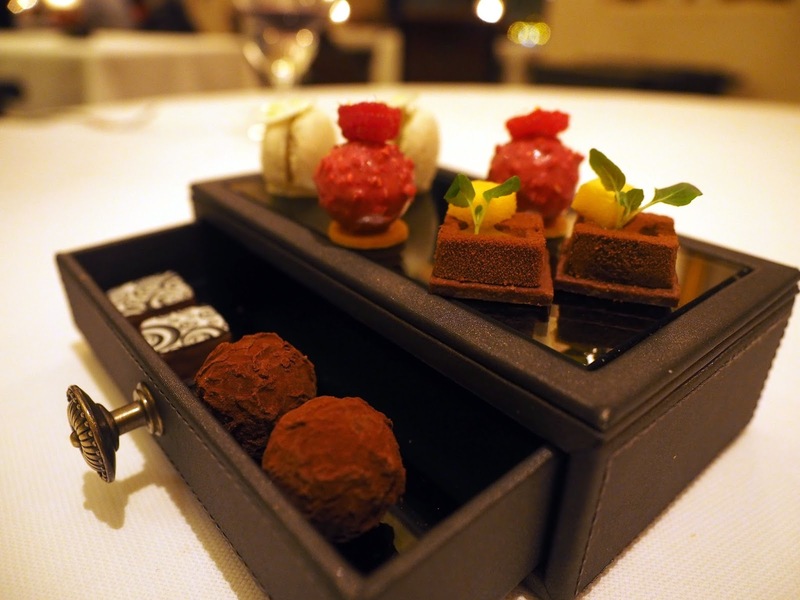 Before our desserts arrived, we were served petit fours. I highly recommend the mojito macaron and the whiskey truffle - if you're feeling full (as I was), then give the others a miss. 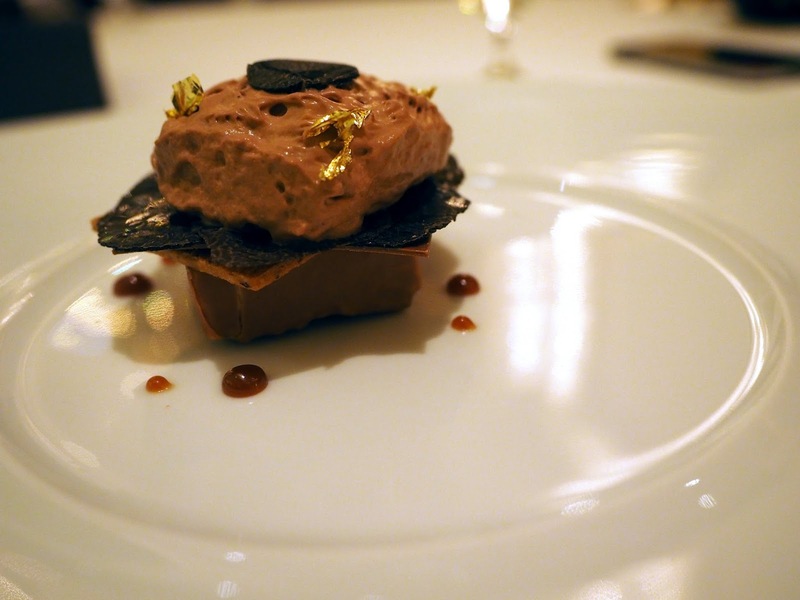 This is because the final dish, a hazelenut sable with praline mousse, and black truffle ice cream, is divine. If you don't appreciate a lime tang to your desserts, you may want to ask them to serve it without the kaffir lime foam, but I think it balances out the richness and smoothness of the mousse perfectly. This is one thing I found rather baffling. Caprice has, to my mind, always been associated with impeccable, almost unparalleled, service. I recall on my previous visits waitresses escorting me to the bathroom; and of a ring of waiters encircling all the guests at the table, carefully lifting up the cloche covers simultaneously like they had choreographed their routine. This time, the service was friendly (we were offered menus to takeaway with us as souvenirs and encouraged to take home the caramel candies at the end) but somewhat casual (we had a brief, casual conversation with a fairly young, warm waiter on how we found the food and what his favourite dish on the truffle menu was). This is not to say that I didn't enjoy it (in fact if anything, I found it made the restaurant feel more approachable), but there were times when I caught myself wondering what had happened to the "old Caprice service" - like when no one unrolled the napkin for me to place it on my lap and I had to do it myself (oh the horror! How preposterous! ), one waiter was seen ironing the table cloth at the table opposite us, and how my plate was taken away before my boyfriend's was (and while he was still eating). All in all, I would still recommend Caprice as a restaurant for a special occasion due to its central location, friendly service, and warm but opulent atmosphere (so don't worry girls, you can still send this post to your boyfriends as a hint for Valentine's Day). 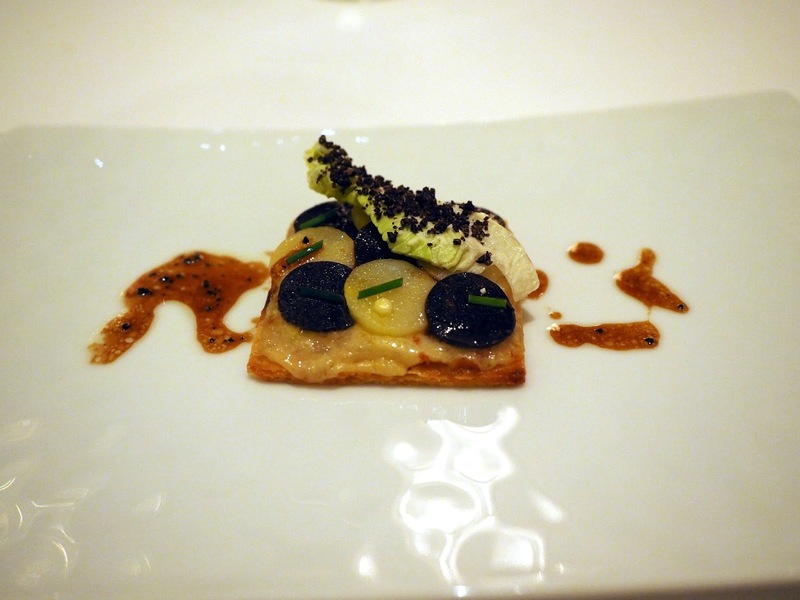 Having said that, I feel the downgrade from three michelin stars to two was perhaps warranted, and that it is best to stick to the à la carte menu, which serves up their classic specialties (including their famous cheese), rather than adventuring to a seasonal menu where dishes take on a more experimental turn. PS. Photos courtesy of The Boy. Aside from the last one, obviously.